Join the LAPD Valley Traffic Division at the North Hollywood Target store parking lot on the corner of Vineland and Vanowen from 8am to 1pm. 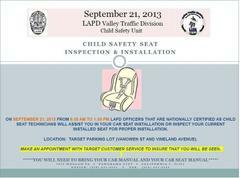 We will assist and demonstrate the proper installation of all types of child safety seats. Constituents will be served on a first come first served basis.